The party lasted a day and a half; the crowd gigantic, and the security tight. The party purposed to produce a standard-bearer, between the Herdsman, the Fedora and the Headtie, for a bigger, general party coming up in April when other event managers will compete with participants of last week’s party to bring about an overall leader for the kingdom. The process is called Daemon Crazy or, as the strange one (Fela Anikulapo Kuti) called it, Dem All Crazy! And indeed, the daemons are really crazy. The event managers had perfected plans to prevent the Herdsman from emerging as the standard-bearer by any means necessary. Warnings were given to the people’s representatives who will aye or nay at the event that whoever supports the Herdsman will be ‘fished out’ and punished. To let the message sink deeper, they had gone the bizarre extent of arranging and labelling the receptacle of the representatives’ wishes according to their states! That way, they would make sure no one got clever and voted as he wished. In the end, it served a dual purpose; the Fedora got the cowards’ votes and the Herdsman got to know the Judases. No one was to exercise their free will or give support according to a contender’s leadership traits or manifesto. People’s representatives were coerced, intimidated and threatened to tow a predetermined line. Preaching the gospel of free and fair selection was just a façade. The daemons are indeed crazy! That party protracted deep into the recesses of the night, nay until the late hours of the morning of the next day. All participants were seated patiently for hours on end. Do we see such calmness and civility in mosques and churches? Can any evangelist, Muslim or Christian, hold his flock’s attention for that long? Some of the Muslim participants forgot to offer zuhr, asr, magrib, isha and (next day’s) subhi salawaat for the period that the party lasted. Each of the contenders gave five minutes address on why he should be chosen above the other to lead the kingdom. It became apparent from their speeches that both were rhetorically challenged. Only the easily gullible could be carried away by incongruent ideas and inconsistent thread of thoughts. Their handlers have done a bad job of polishing their speech delivery skills and their public speaking ability. No wonder then when people like that are beamed on foreign television stations, a transcript of their words is run under the screen for viewers to make some sense out of the gibberish they utter! Don’t marvel at this or attribute it to the fact that the Herdsman has not ‘read’ much. The English language is so elusive that it, often times, fails even holders of PhD (not to mention their ignorant consorts). No wonder, also, that the handlers of the Fedora spared no effort in preventing a televised debate on national issues suggested by the Herdsman. People who cannot think for themselves, and who are, most of the time, visibly unsure of what to say next, should not appear in public debates that will be broadcast live around the world. I don’t desire to comment on the speeches they delivered on that day or the inaccuracies inherent in them. There will not be any purpose in that for the selection was not a corollary to what anybody said or promised to do. The outcome was known to the daemons days before the gathering. The people’s representatives have been cashed and carried already. The whole plan became plain during the counting of the votes cast. The Fedora got almost all the votes from his region; only a negligible few went to the Herdsman. Also, the Fedora got the approval of majority of people’s representatives from the Herdsman’s region. A healthy hypocrisy by ignorant fools who sold their souls, dignity and region for a miserable price! Were they really representing the region’s people? Whenever they find themselves in a position to make a decision between their people, region and deen on the one hand, and their selfish interest, personal self-aggrandisement on the other, they opt for the latter. Even the Herdsman was not immune from this; when he deputised for Do-or-Die Politics in the White Mansion, he cut off all links with his own, his region and deen, to the extent that even such titles as Alhaji, etc were expunged from his name. He deemed obedience to his boss was more important than adhering to the teachings of his deen, and investing in his people, even if not for anything, but his own political future. Now, Do-or-Die Politics has ganged up with the confederates and Judases of the Herdsman’s region and deen to ensure that ‘I dey laugh’ will continue to laugh. The votes from the Fedora’s region have shown that the people prefer their own, their deen and region. They spoke with one voice, and the message was clear: the next leader MUST emerge from among us; there is no other option; while the Herdsman’s people were beset with dissention among themselves, internal strife and hypocrisy, selling their region and deen for a numbered naira and some dollars! They chose the Fedora without recourse to what that may symbolise for worse things to come in the political future of their region and deen. Some territories have done us proud – ko dame kazo an fika (you are superseded in whatever you bring), the Shariah enclave, territory of the Caliphate and environs! If all had been as honest and as conscientious as these, this show of shame would have been averted. The Herdsman’s region has only two options in the forthcoming general party in April. That party is indeed general because it covers the entire kingdom, everybody will take part in all territories. The region should be wary of splitting votes between War Against Indiscipline and Anti-Corruption Crusade. The remaining genuine elders of the region who are not yet possessed by the crazy daemons should speak with these two contenders with a view to merging them into one. The general party will have an invitation card. No one will be allowed in without such card, and everybody has to register now for it. Registering for the voters’ card is a national, regional and religious responsibility. We all must make sure that we attend the party and have fun! A summary of the doctrines of Boko Haram and Darul Islam could be: separation from the larger society and worldliness; rejection of modernity and progressive education; belief must be matched by practice, hence their rigid and strict application of the text. I have seen a community in America that shares these beliefs and practices them. At the end of our stay in Washington DC during the 2010 International Visitor Leadership Program, we left for Philadelphia, Pennsylvania. Before arrival at our destination we stopped for lunch and a tour Amish community of Lancaster County, Pennsylvania. This is a peaceful, non-violent community that chooses to be different, to live life according to its understanding of the Scriptures. The American government let them be, accepts them as they are, and respects their beliefs; it did not banish them from their homes, as we witnessed with Darul Islam, or rout and kill them extrajudicially, as the Nigeria Police did with Boko Haram (of course, anyone might argue that the Amish community did not take up arms against the American government and people and they would be correct! However, they would have also forgotten that the Boko Haraam group were not fighting anyone until the government law enforcement agencies started attacking and killing them). No wonder then that the theme of our Philadelphia, Pennsylvania visit was ‘Religious Freedom, Tolerance and U.S Constitution.’ My respect for America increased tremendously! The system is simple: you will not be hindered in any way from practicing the religion you profess, but you must do that without infringing on the rights of others or hurting their religious feelings. 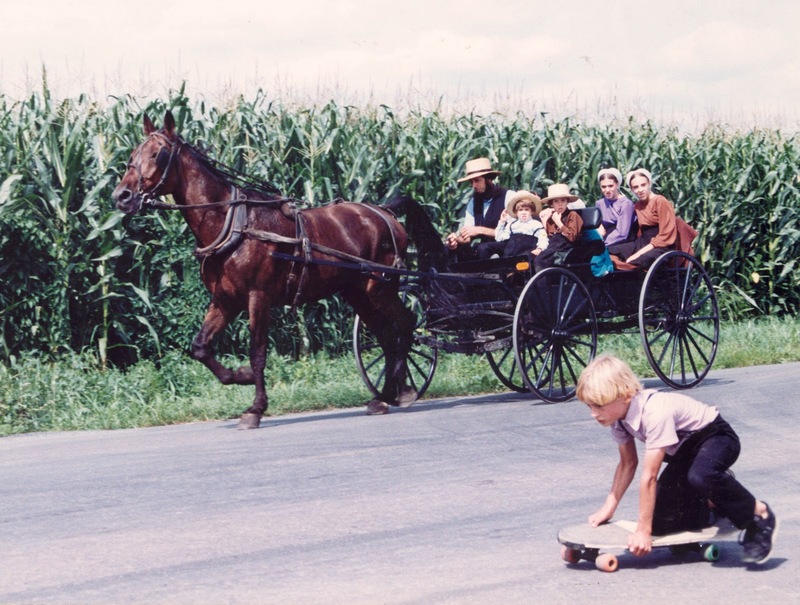 The beginning of Amish people (1525) dates from a group of persecuted radical Christians nicknamed ‘Anabaptists’ at the time of the Protestant Reformation in Europe. They sought a return to the simplicity of faith and practice as seen in the early Christian church in the Bible. 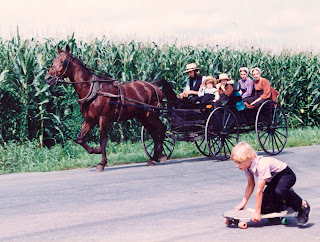 The Amish stress that belief must result in practice. ‘By their fruits you shall know them’ (Matthew 7:20). The emphasis is on lifestyle; hence, they tend to be cautious on technology and involvement with the larger world. They refrain from driving cars; their mode of transportation is by horse-drawn carriages – buggies, they call them. It is only in movies depicting life in years gone by, or the dramatized version of The Adventures of Sherlock Holmes and similarly themed settings that I see carriages like that. The dressing is ‘plain’, maintaining the highest standard of simplicity and humility; how one lives reflects their faith, our tour guide informed us; clothing is simply another expression of their deepest convictions. It does not mean that these people desire to be odd; they purpose instead to practice humility, simplicity, non-conformity, and modesty. Men and boys wear dark suit coats which have no lapels and fasten with hooks and eyes. Trousers are made in the traditional broad fall pattern are usually held up by suspenders. Shirts are made of solid coloured fabric. Shoes are black for dress up, but often brown for work. Broad-brimmed hats made of either straw or black felt are worn outdoors. The hair is blunt cut and combed front in bangs. Long beards are the mark of an adult man but they do not wear moustaches. Women and girls wear dresses with full skirts made of solid coloured fabric (a vivid contrast to the nakedness we witnessed in other places); frequently blue, green, grey, purple or, for some occasions, black. An apron is nearly always worn and a cape often covers the bodice of the dress. Black shoes and stockings are proper for going out. The women and girls do not cut their hair. They wear it parted in the middle and combed back from the face, then twisted into a bun at the back of the head or nape of the neck. A white, or in some cases black, cap-type head covering is worn in obedience to the biblical instruction in 1 Corinthians 11:2-16. When going out, especially to church, women put a large bonnet and shawl. No one wears jewellery. Like the people of Boko Haram and Darul Islam in Nigeria, the Amish are not comfortable with Boko, western, progressive education. They question whether attending high school and university lead to greater wisdom or obedience to the Creator. They are not, by this position, against education or learning. Far from that! Learning from others is an important value. It is the popular version of education offered by America’s consolidated public high schools that especially troubles parents of this faith. An Amish teenager and an average American teenager would probably know about the same number of facts (the Amish child knows less about science, technology, and the arts, but more about soil, animal and plant care, and basic skills like carpentry, masonry and food preservation). In addition the Amish child is bilingual, has an enormous sense of security, and has learned to foster values as a way of life. The Amish want their children to learn basics such as reading, writing, and arithmetic. This they offer in a local one-room school (similar to the one operated by Darul Islam) with a minimum of worldly influences. Athletics and other worldly courses where students have to be in semi-naked sportswear are not taught here. As the court pleases! So say our lawyers after such pronouncements in court. The Amish won. Their local one-room system of education accepted for their children to attain the basics, not beyond the eighth grade. Thus they pay public school taxes and also pay the full expenses of their local system of imparting knowledge. Another lecture we had during the Washington programme I referred to in my Letter From America was that of Imam Yahya M. Hendi, a Muslim chaplain at Georgetown University, the first American University to hire a full-time Muslim chaplain. Imam Hendi is also the Imam of the Islamic Society of Frederick, and is the Muslim Chaplain at the National Naval Medical Center in Bethesda, MD. He also serves as a member and the spokesperson of the Islamic Jurisprudence Council of North America. Imam Hendi holds a Master’s degree in Comparative Religion from Hartford Seminary, Hardford, CT. He is the President and Founder of Clergy without Borders. The lecture Imam Yahya gave centred on the strategies of Clergy without Borders in promoting interfaith dialogue and conflict resolution. The basic premise of Clergy without Borders is that all religions contain a message of commitment to improving the world but that too often the differences rather than the commonalities become the subject for discussion. The mutual recognition of the values of our charter is meant to enhance an active pluralism that goes beyond mere tolerance, but one that does not seek to remove the meaningful borders between us, by building bridges rather than constructing barriers. Clergy without Borders is working towards acknowledging, celebrating, and then transcending religious differences. It empowers religious leaders to explore and utilise the resources of their diverse religious traditions in the advancement of world peace: incorporating classical spiritual texts, traditions, and rituals; utilising contemporary conflict resolution disciplines, respecting and embodying religious pluralism. The organisation educates clergy toward greater understanding of other traditions, exploring differences and commonalities in the three Abrahamic faiths of Islam, Christianity and Judaism. After the unfortunate events of 9/11, Imam Hendi mentioned, a mosque was destroyed, burnt in America and the entire community – Christians, Jews and followers of other faiths - came to the aid of the Muslims in renovating it. The Catholic Church was the highest donor with $60, 000 for the renovation work that cost $86, 000. Christians helping Muslims to rebuild a burnt mosque in America…? Also, Imam Hendi revealed that when Pastor Terry Jones came up with his madness of an ‘International Burn the Quran Day’, followers of all religions in America opposed and saved him from his own delusion. What lesson is there in Imam Hendi’s lecture for Muslims and Christians in Nigeria? Are our Christian brethren resisting evil….? If the right cheek is smitten, is the right one turned also…? (Matthew 5:39) Didn't Jesus Christ, peace be upon him, adjure the Christians in these words: ‘…But I say unto you, Love your enemies, bless them that curse you, do good to them that hate you, and pray for them that which despitefully use you, and persecute you;…. (Matthew 5:44; Luke 6:28)? A good Christian cannot intercept and kill travellers on the basis of their faith or because such innocent wayfarers are not Christians. Where is the purport of Surah al Hajj verse 40 in preserving the sanctity of cloisters, churches, oratories and synagogues? Have we thrown behind our backs the Prophet’s instructions, even at the time of war, that trees are not to be cut down, properties are not burnt, women and children are spared; that the one who flees from the frontlines and closes his door behind him should not be harmed, and that priests in their places of devotions are not molested, killed or expelled? And if the one who closes his door behind him is spared, where have people got the authority of breaking into dwellings and killing their inhabitants? If no soul bears the burden of another (Al An’aam 6:164), why will a non-Muslim in your country pay for the wrong committed by another non-Muslim elsewhere? “This is the protection which the servant of Allah, ‘Umar, the Commander of the Faithful has granted to the people of Jerusalem. The protection is for their lives and properties, their churches and crosses, their sick and healthy and for their coreligionists. Their churches shall not be used for habitation, nor shall they be demolished, nor shall any injury be done to them or their compounds, or to their crosses, nor shall their properties be injured in any way. The Bishop took Umar around Jerusalem for a sightseeing tour in the following day. The Commander of the Faithful offered the salutational prayer at the David’s niche of the al Aqsa mosque. During the latter part of his tour, and while ‘Umar was at Al Qiamah Church, noon prayer was due. So, the Bishop asked ‘Umar if he could offer his prayer in the church, being Allah’s house too. ‘Umar, however, politely declined the offer on the grounds that should he pray in the church, Muslims later on may take it as a commendable tradition, and end up therefore expelling Christians from their churches, and unpardonable violation of the Pledge of Security Muslims had concluded with them. The above episode is indeed a memorable one in history, as it brings into spotlight one of the most significant features of Islam, namely tolerance and peaceful coexistence. There is no way Muslims, who abide by the true spirit of Islam and stick to its real essence, could ever persecute Christians or kill them in their place of worship! The realisation of and respect for the differences between the two religions and continuous emphasis of what we share in common is the key to goodwill and peace in this country and the world over. "I am neither afraid of prison nor the death penalty. I am not content with leniency or freedom. And I was not mournful when accused of killing people in the path of Allah and at this moment I'd proclaim: 'In the name of Allah, I have won.'" The above remorseless words were part of the content of a letter written weeks ago by Mukhlas, 48, one of the three brothers (the other two being Imam Samudra, 38 and Amrozi, 46) sentenced to death five years ago for their roles in the Bali's Kuta strip bombings of October 12, 2002 that killed 202 people. Before their execution by firing squad on Sunday November 9, 2008, the brothers had repeatedly said they wanted to die as 'martyrs' for their cause; T-shirts praising them went on sale with inscriptions like: "Even if Amrozi and friends are executed, jihad will go on." Hours after the execution, nearly a thousand Muslims marched in East Java on Sunday chanting Allaahu Akbar and vowing revenge as the bodies of the brothers arrived in their hometown of Tenggulun. A similar chaotic scene erupted in the West Java village of Serang, where heavily armed police officers struggled to restrain a raucous crowd as mourners carry the coffin of Imam Samudra with another series of takbeeraat (Allah is Great!). When he heard the news of the executions, Mohammad Chozin, the brother of Mukhlas and Amrozi, prayed: "May our brothers, Allah willing, be invited by green birds to al-Jannah." My religion does not teach taking the life of innocent soul. This is a grave sin! "…whosoever kills a human being for other than manslaughter or corruption in the earth, it shall be as if he had killed all mankind, and whoso saves the life of one, it shall be as if he had saved the life of all mankind. (Al-Maa'idah, 5:32). The Prophet Muhammad, peace and blessings be upon him, mentioned a special place in Hell reserved for a woman who imprisoned a cat till it died of starvation – she neither fed the cat nor freed it so that it could feed itself. (Sahih al-Bukhari, vol. 1, Hadeeth 712). This punishment was for killing a cat. Of course there should be a sterner punishment for killing a human being. The teachings of the Prophet taught us that a believer remains within the scope of his religion as long as he doesn't kill another person illegally. Even in war Muslims are commanded to only fight those who fight them, who take up arms against them. No tree is cut down, no property is destroyed; women, old people, children and even monk in his place of worship and seclusion are not killed. I cannot understand, with all these proofs from the sources of Islam, why one will detonate a devise that will cause the death of many innocent people. It was unfortunate that one of the brothers was quoted as saying that his only regret was that some Muslims died in the blast. All human beings, Muslims and non-Muslims, are honoured by Allah as His vicegerents on earth! Jakarta merits full marks for successfully holding an open trial, and for allowing the law to take its due course. The brothers confessed to what they did and never for a moment expressed remorse over their actions. They remained defiant till the very end. It is disheartening that they had gone on record saying they carried out the attacks in retaliation for the US-led invasion of Afghanistan. With Obama's win, we hope to see an end to the 'with-us-or-against-us' policies of President Bush's response to 9/11 attacks on the US. We do not subscribe to the attacks or his biased approach on the so-called war on terror; what the three Indonesians did by way of retribution is not acceptable either. Their misunderstanding of the concept of jihad does not reflect or represent the teachings of Islam or the Muslim world. Certainly, their beliefs and ideological convictions had nothing to do with their actions. For their misconception, it is hoped that Allah will forgive them. And attempt by some Indonesian groups to lionize the three brothers as martyrs and Islamic heroes is both unfortunate and unreasonable. It is necessary for President Obama to examine why many people in faraway places like Indonesia and the rest of the world are so unhappy with America. If America doesn't understand the cause, it can't prevent its effects.